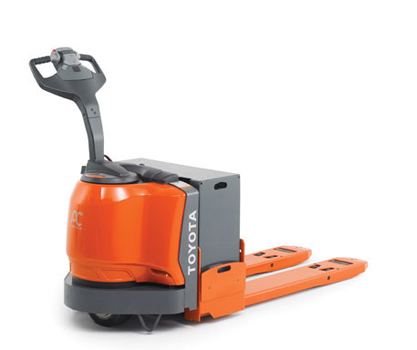 Featuring AC Drive System Technology, Toyota offers a wide range of 24 Volt, electric pallet jacks to meet your productivity needs. Industry leading levels of performance and reliability can be found in all of our walkie pallet, end-control walkie/rider, center control rider and tow tractor units. Attention to operator efficiencies and ease of service put overall equipment value to work for you. Multifunction Control Handle comes equipped with large dual thumb wheels, lift, lower and horn buttons for simplified operation of all controls with either hand. Hand Grips are designed at an angle to fit the operator's natural hand position comfortably, helping to reduce fatigue and increase operator efficiency. Directional Thumb Wheels are designed to enhance comfort by minimizing hand and wrist fatigue. AC drive system offers fast response to operating commands, precise power control, compact components and facilitates high productivity throughout the entire shift. AC drive motor offers excellent acceleration and top travel speed, loaded or unloaded, while improving battery efficiency through regenerative braking. Regenerative braking improves overall efficiency and prolongs brake component life. Programmable performance parameters may be customized through the digital display to meet a wide range of job applications and operator skill levels. Lift limit switch stops the hydraulic motor at maximum lift height to reduce unnecessary strain on the lift components and preserve battery life. Hydraulic overload protection valve prevents operators exceeding the unit's rated load handling capacity. Dual lift cylinders provide efficient hydraulic power for smooth, effortless, lifting to reduce component wear. AC drive motors have no springs, brushes, commutator or wearable parts thus reducing planned maintenance. One piece, lightweight service access cover conveniently snaps on and off for easy access to major components reducing service time during inspection. On-board self-diagnostics with built in analyzer simplifies troubleshooting and eliminates the need for an external hand-held analyzer. AC drive system eliminates the need for the directional contactors thus reducing routine maintenance and inspection time. Drive tire replacement is simplified by removing only five bolts to maximize uptime and productivity. One-Piece, high-strength service cover protects the electrical, hydraulic and mechanical components against damage. Controller Area Network (CAN-bus) communication technology provides precise, fast and reliable control of all truck functions with fewer electrical components. Welded construction with steel gussets strengthens the tractor bumper to help protect critical components against impact, increasing equipment life. Powder coat paint finish provides added durability against paint flaking or chipping upon impact. Box rail fork construction provides torsional rigidity and maximum strength to prevent premature fatigue. Steel bulkhead wrappers protect vital system components and increase product life. Heavy duty bushings and pins add strength and stability for increased component life. Fork Linkage contains Teflon® Coated PolylubeTM Bushings that require no lubrication. Four-point lift linkage system adds strength and rigidity at the piston shaft connecting point for better load stability. Polymer service cover will not bend, dent, fade, or rust and helps protect all internal system components against damage. Solid steel pull rods provide added strength throughout the entire length of the forks. Hall-effect switches eliminate wear components and require no mechanical adjustments resulting in increased component life. Thermal protection and current limiting circuitry protects internal components from damage. Suited for customers who move materials in and out of: cold storage facilities; chemical and salt and brine industries; or in areas where frequent wash down is required to remove contaminants. Heavy duty Teflon® coated PolylubeTM bushings that require no lubrication and add strength and stability. A motor controller splashguard that helps deflect debris and moisture from entering the traction motor controller area.